Shop at the open studios of 5 Sebastopol artists the first two weekends in December. Along with our usual work, we will have special gift items in time for holiday giving. 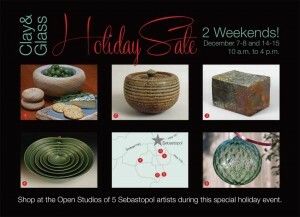 Our studio at 7540 Gates Drive in Sebastopol will be open from 10am to 4pm on December 7-8 and 14-15. Contact us for more information. Clicking on the image will provide a closer look.